Ready to cash out and sell your entire collection on MTGO? We buy collections of all sizes and offer a variety of payment options. PayPal - This is the fastest method, although you will generally pay a fee of $.30 + 2.9%. We cannot send via personal payments since this is a business transaction. ACH Direct Deposit - Requires a US Bank Account. There are no fees and you will receive the funds within 1-2 business days. Company Check - We will mail the company check within one business day. There are no fees, but you will have to wait for the check in the mail. Wire Transfer - $30 fee in the US, $40 fee for international. You will receive the funds within 1-2 business days. In order to receive a quote on your collection, you will need to send us a CSV file list of your Collection. 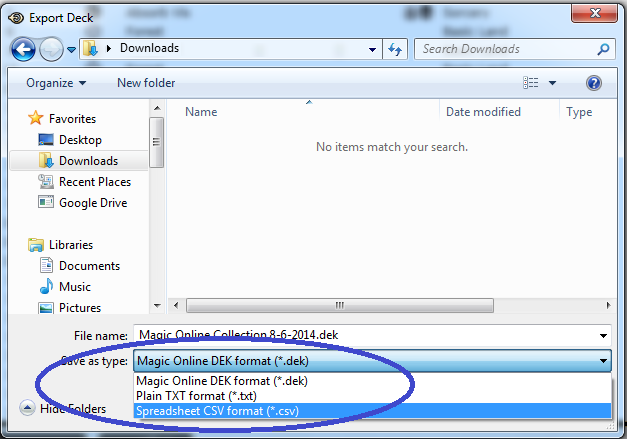 A CSV (Comma Seperated Value) file is simply a text file listing the cards in your collection. 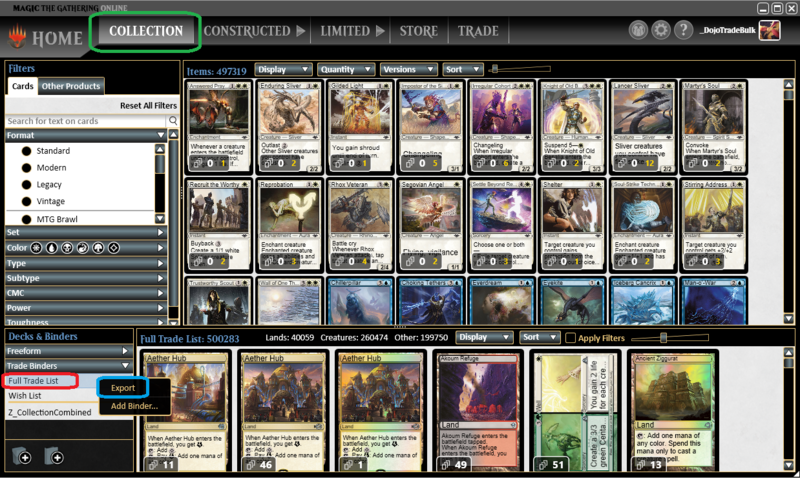 Open MTGO and click on the Collection tab (circled in green below). In the lower left corner, click on the "Trade Binders" item under "Decks & Binders to expand it. Click the "Save as type" dropdown box in the Save As dialog, and change it to "Spreadsheet CSV format (*.CSV) (Circled in dark blue on the second image below)"
Save the CSV file somewhere on your computer that you will remember. Save it with a useful filename like "MyUsername Collection.csv"